Just minutes ago in a private conservative blogger pre-press conference chat, Texas Attorney General Greg Abbott officially announced that he is running for Governor of Texas. This announcement was not unexpected. Abbott has been a rising star in the Republican Party because of his effective and unwavering stance on promoting and protecting Christian, conservative values. The past couple of years have kept Greg Abbott Very busy because of the many attacks on Texas from Obama that Abbott has had to fight off. Many times he has been successful in defeating Obama even all the way up to the Supreme Court. Abbott once said that he loves his job because his typical day is going to work, suing Obama, and then going home. Other candidate for Texas Governor include Tom Pauken. Tom Pauken is a great guy and a good conservative too. Unfortunately you can only pick one person and Greg Abbott will be the next Governor. 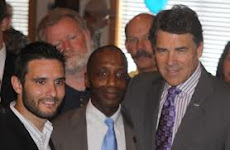 Abbott has the energy, excitement, momentum, values, and money to easily win the race for Governor and I believe he will. Barry Smitherman has already announced that he will be running for Texas Attorney General. I do not know who else is running for Texas AG, but I like and support Smitherman. He is a strong Christian conservative and is very genuine and sincere anytime I have had the pleasure of talking with him. Greg Abbott to United Nations: Don't Mess with Texas Elections or you will be Arrested!